There’s a hectic weekend ahead, shopping for posh frocks and elegant hats, for the VIP guests invited to the naming celebrations of P&O Cruises’ Britannia next week. The ship will host a gala dinner on-board on Monday evening, and the official naming ceremony – by Her Majesty The Queen – on Tuesday morning. 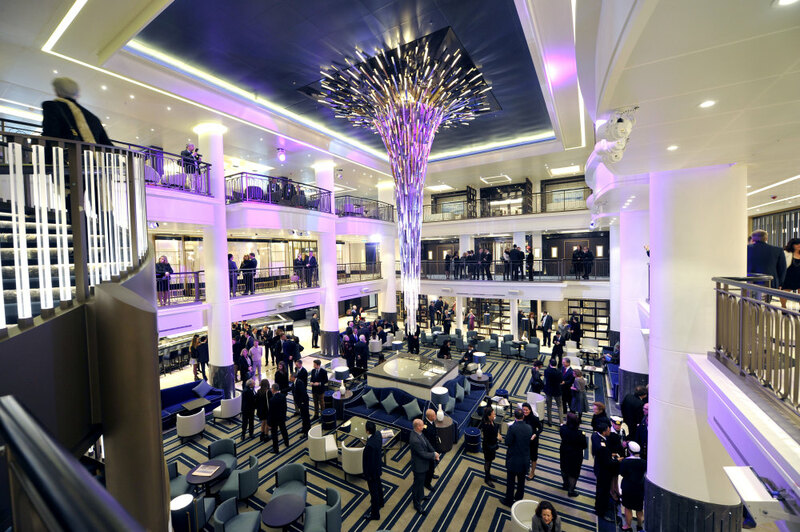 A host of celebrities have been invited, among them celebrity chefs who will be involved in Britannia’s Cookery Club, and several stars of Strictly Come Dancing, which is a featured highlight on P&O ships throughout the year. P&O Cruises offers a selection of Strictly Come Dancing themed cruise itineraries and stars from the hit BBC television programme past and present are on the guest list. They are led by retired ballerina and Strictly judge Darcey Bussell CBE, who is the godmother to P&O’s Azura. She will be joined by professional dancers Natalie Lowe and Ian Waite, and the Strictly co-host, Tess Daly. Former Bond girl Fiona Fullerton, voted out if Series 11 in week eight, is also among the guests, together with swimmer Mark Foster, who appeared in Series Six. Olympian Sally Gunnell OBE is expected to attend as well as television presenter Martin Roberts, co-host of BBC television series Homes Under The Hammer, and actress Anne Reid MBE, who has starred in Coronation Street; Dinnerladies; and Last Tango in Halifax. Another Corrie star, actress and impressionist Deborah Stephenson, will be there as well actor Shaun Dooley, who has appeared in EastEnders and The Street. Lesley Nicol – Downton Abbey’s doughty cook, Mrs Patmore – will also be present. Star of Birds of a Feather Linda Robson is on the guest list along with presenter Anneka Rice, famous for the ’80s television series Treasure Hunt and Challenge Anneka. Soprano Laura Wright will be present as will be arts interviewer Fiona Lindsay and hair stylist Nicky Clarke. They will be joined by Sunday Times bestselling author Milly Johnson, author of Here Come The Girls, a romantic tale revolving around a cruise. Last but not least is comedian Rob Brydon, the face of P&O’s current TV advertising campaign.